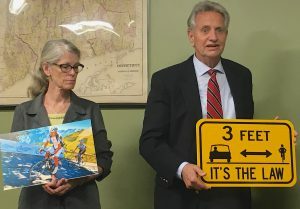 At a Sept. 19 meeting, the Board of Selectmen in Morris accepted a donation of 10 roadside cycling safety signs from Cramer & Anderson, given as part of a multi-town initiative to remember and pay tribute to the firm’s late Partner David P. Burke. Attorney Burke was cycling alongside Bantam Lake on Route 209 in Morris on the morning of March 12, 2016, when his bike hit a pothole and he was propelled into a guardrail. He was flown by Life Star helicopter to Saint Mary’s Hospital in Waterbury, where he died March 15, 2016, his 63rd birthday. Cramer & Anderson Partners Dolores “Lorry” Schiesel and Perley Grimes at the Morris Board of Selectmen meeting. Cramer & Anderson Partners Perley Grimes and Dolores Schiesel, an avid cyclist, presented the signs to Morris First Selectman Tom Weik, Selectmen Erica Dorsett-Mathews, and Selectman Vinnie Aiello. The attorneys described the firm’s cycling safety initiative, led by Partner John D. Tower, as a way of honoring the legacy of Attorney Burke, a Renaissance man who loved cycling, skiing, French cooking and photography, among other passions. Attorney Schiesel showed the selectmen a photograph of Attorney Burke cycling with his daughter Victoria amid a dramatic high landscape along the Tour de France route in France. In accepting the donation, the Morris selectmen acknowledged the dangers cyclists face on Connecticut roadways and the importance of making motorists aware of the state laws in place to safeguard cyclists. Attorney Schiesel later expressed gratitude to the officials, especially Tom Weik, who is also an avid rider, for understanding and supporting the importance of enhancing safety for cyclists as they enjoy the beautiful roads in the Litchfield Hills. The reflective yellow roadside warning signs donated by Cramer & Anderson say, “3 feet – it’s the law,” a way of highlighting the Conn. Gen. Stat. § 14-232(a) requirement that motorists must respect the rights of cyclists and grant them a “safe distance” of at least 3 feet when passing. In making the donations, Cramer & Anderson attorneys are noting that while the signs offer a warning based on Connecticut law, they are not official, legally enforceable state or municipal highway signs. Morris is the third Connecticut municipality to accept a donation of 10 signs from the firm. New Milford Mayor David Gronbach and the Town Council accepted a donation of 10 signs in April. Town Engineer Daniel Stanton is working with the town’s Bike & Trails Committee to determine where the signs should be placed. In June, the Danbury City Council unanimously approved accepting Cramer & Anderson’s donation of cycling safety signs. Signs will also be offered to Redding, where Attorney Burke lived with his wife, June Anne. “David was a terrific person, an excellent attorney, a devoted father and bicyclist, and a close friend of ours, and we think this is suitable way to remember and honor him,” Attorney Tower wrote in an email to Mayor Gronbach concerning the donation of signs to New Milford. “He just was a phenomenal person, and an incredibly talented lawyer,” Cramer & Anderson Partner William C. Franklin said of Attorney Burke in a tribute on the Cramer & Anderson website. “Everything he did, he was all in—everything from bicycling to skiing, to cooking and photography,” Attorney Casagrande said in the website tribute. Attorney Burke was among many Cramer & Anderson attorneys and staff who shared a passion for cycling. A group participates in the Greater Danbury Ride of Silence each May as a way of remembering and honoring Attorney Burke. Sponsored by the group Bicycle Advocacy of Greater Danbury, the local ride is part of the larger Ride of Silence movement, which honors cyclists killed or injured by motorists. By donating a total of 40 cycling safety signs to four municipalities with hundreds of miles of favored cycling routes, Cramer & Anderson hopes to address a national safety issue in a poignant way and make a difference for cyclists in the region that was home to their late Partner and friend David Burke. 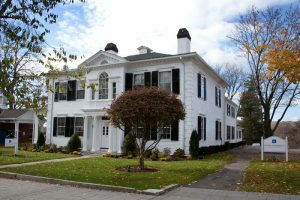 The firm has offices in New Milford, Danbury, Litchfield, Kent, and Washington Depot. For more information, see the website at crameranderson.com or call the New Milford office at (860) 355-2631.